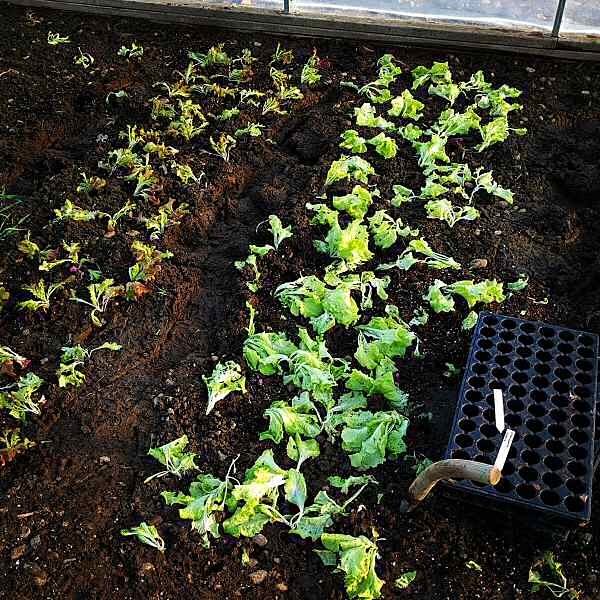 Transplanting lettuce into the unheated greenhouse, filling it out in small sections to work around wetter areas. The seedlings, waiting for drier conditions, stayed a couple of weeks longer in trays than ideal—now they’re a little floppy and stretched, but I’m confident they’ll figure it out. This first spring, seeing how the ground dries in the new hoophouse is part of the learning curve. Tiny farming! Glad to see you’re back online, Mike! Wow your transplants have some nice size to them! I’m jealous. Don’t be! :) They’re way bigger than necessary, I had to keep ’em under lights longer than expected, while they were struggling to bust loose and grow. Smaller seedlings started later would easily catch up to these!